Posted January 30, 2012 by Matt & filed under News. 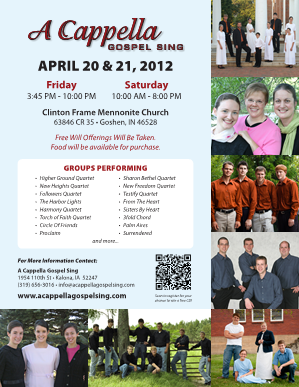 If you happen to live near / travel by Goshen, Indiana April 20-21, we will be singing at the 2012 A cappella Gospel Sing in Clinton Frame Mennonite Church. Posted by Matt & filed under News. We are planning to give a Sunday evening program February 5 at Crossroads Mennonite Church in Richfield, PA. We welcome everyone to join us there for an evening of worship. Posted May 27, 2011 by Matt & filed under News. We have been very busy spreading the Good News in singing! It’s exciting to reach out to people in this way. I’ve had had many people come up to me and ask about a recording / CD. Unfortunately, we do not yet have the funds to produce a CD. We’re trying our best to raise the funds. Posted April 3, 2011 by Matt & filed under News. Please be in prayer for us as a ministry team as we prepare to serve in a prison crusade this weekend. We will be joining Light of Hope, who organizes several churches into a united effort that reaches in to some of the larger institutions of PA.
Posted March 13, 2011 by Matt & filed under Media.